Harvest takes place all through the year in the United States. There are carrots and pineapples in January, strawberries and salmon in April, green beans and watermelon in July, turkeys and peanuts in November. In a wonderfully clear and concise text, Cris gives readers a month-by-month sampling of the wide diversity and volume of crops grown throughout the United States. 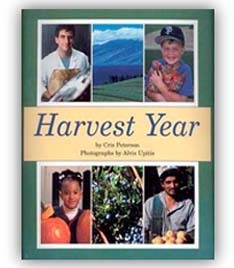 Alvis Upitis provides a stunning array of photographs, capturing the brilliant colors of the fields and orchards, the amazing variety of workers and machines, and an engaging assortment of children sampling foods from the year-round harvest. Harvest Year is a rich bounty for all ages.